In order to successfully raise large VC rounds of more than US$100m, in the US also referred to as Private IPO, (FinTech) startups need to win over US investors. Recent research has shown that European late stage funding rounds that involved US investors were on average 5x as high as non US investor rounds. Thus, involvement of US investors in funding strategies seems crucial in order to stay competitive at global scale. AND: The later the stage, the more important US investors become. Who are the leading (US) FinTech investors? Barkow Consulting has now identified globally leading FinTech investors, most of which are indeed US based. We have gone through publicly available databases, double checked with websites from companies and venture capitalists etc. Finally, we have complemented our analysis with third party research and skimmed trough press announcements. Despite all efforts, we are aware that our ranking is not and will probably never be complete. However, we are confident that our data base is fairly representative. Thus, we feel comfortable of introducing the FinTech Club of 20. We have included any VC or corporation, that has invested in at least 20 FinTech startups globally since 2009. We have not considered pure play accelerators such as FinTech innovation or Startupbootcamp, some of which might have higher numbers of FinTech investments due to their specific high speed, mass volume and low investment approach. 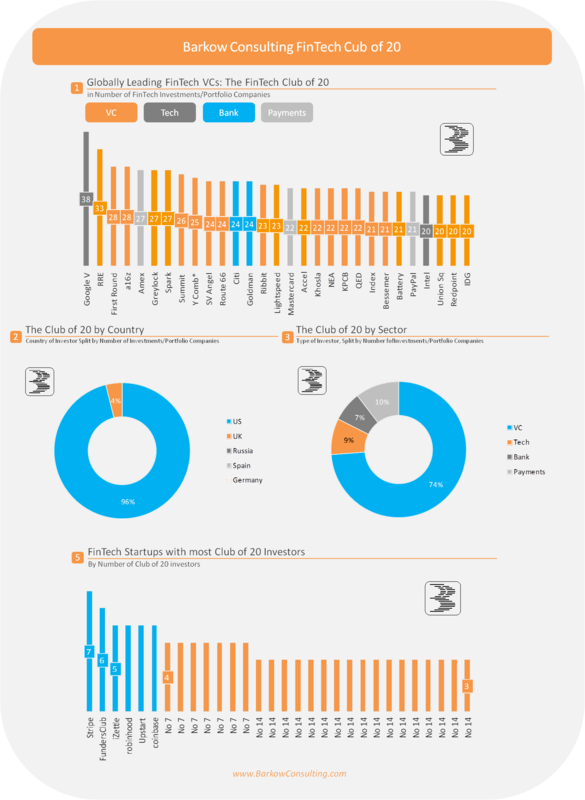 Even without accelerators the FinTech Club of 20 is currently 29 members strong.